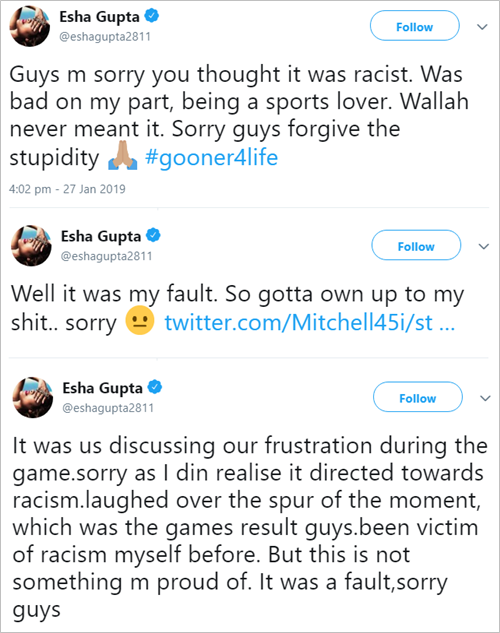 Whatever the precise nature of Esha Gupta’s ambassadorial role with Arsenal was, it must surely be a thing of the past after the Indian actress/model was found to have used racial slurs while criticising Alex Iwobi. 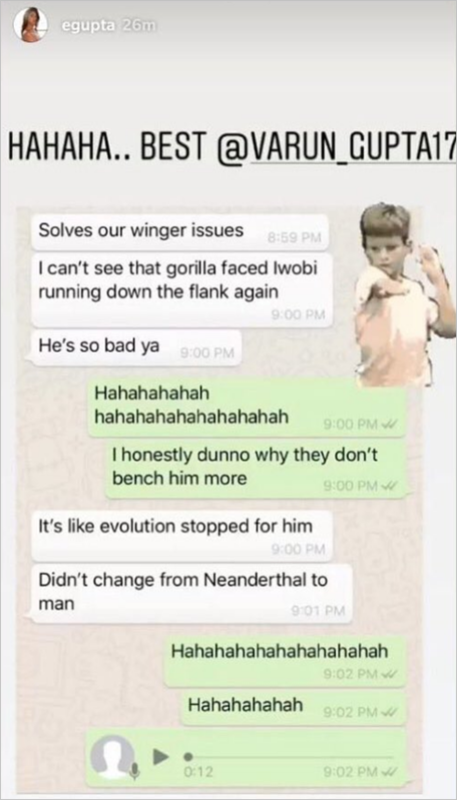 Having watched the Gunners go out of the FA Cup on Friday night, Gupta discussed Iwobi’s performance with a friend who referred to the Nigeria winger as a “gorilla” and a “neanderthal”. After being called out on the dreadfulness of the messages (most notably by Daily Cannon writer Dan Critchlow), Gupta sought to make amends by issuing the now standard “sorry if u were offended” half-apology over a series of increasingly vapid tweets. She didn’t realise the discussion had “directed towards racism”? Well, that’s certainly a new one. Pies aren’t entirely sure what Gupta’s role as Arsenal envoy entails – she has assisted in a kit launch before – but we can only assume, nay hope, that it doesn’t go on for much longer. There is no way on earth that Arsenal Football Club will let this go. I’ll be amazed (and disgusted) if she’s still in her job by the end of this week. Yeah, this person’s dumb as hell but this whole idea you can only insult the looks of White people is, too. Replace ‘Alex Iwobi’ with ‘Jamie Vardy’ and ‘Gorilla’ with ‘Rat’ and suddenly there’s no story though. Gotta create outrage for clicks! @Anonymous: I’d hope you recognise that one of those insults carries a little more historical weight than the other. I wrote my thesis on racism within sport, and while researching I came across some disturbingly mind blowing articles and books about the eugenics movement which explain the whole monkey, gorilla comparison. Well worth checking out. She’s Indian and is misinformed. I don’t think it was supposed to be malicious, she probably has no clue about the connotations in the western world. Which is no excuse though of course.